Rcpp reached a nice round milestone yesterday: 250 packages on CRAN now depend on it (as measured by Depends, Imports and LinkingTo declarations). The graph is on the left depicts the growth of Rcpp over time. Or at least since I started to write down some usage numbers: first informally, then via a script. 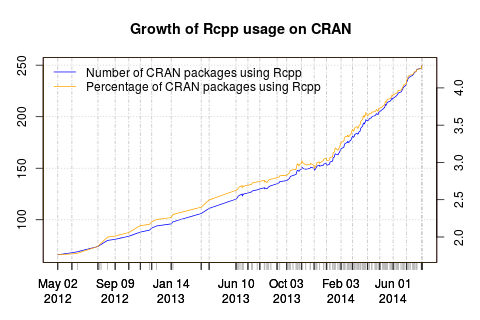 Also displayed is the relative proportion of CRAN packages using it. Rcpp cleared the four per-cent hurdle just before useR! 2014 where I showed a similar graph (as two distinct graphs) in my invited talk. 250 is a pretty impressive, and rather humbling, number. From everybody behind Rcpp, I would like to say a heartfelt Thank You! to all the users and of course contributors.